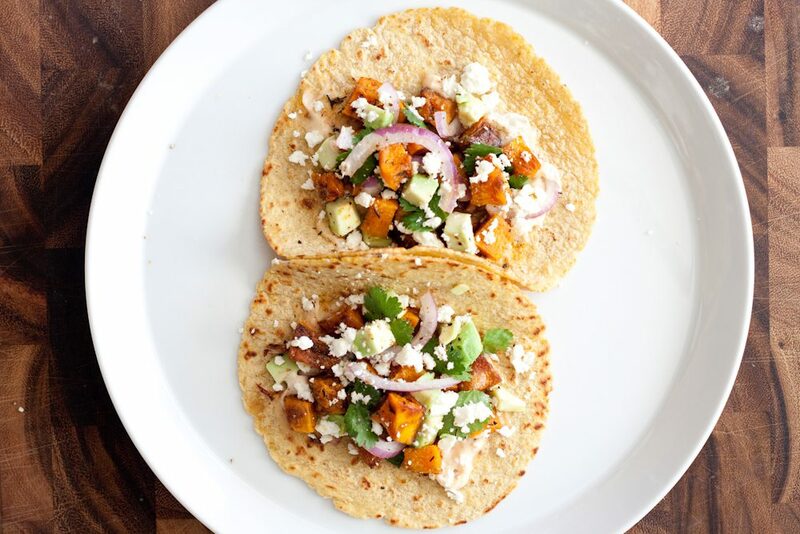 These genius butternut squash tacos come from blogger Supper at Six and they are a delicious alternative to your typical taco filling. Her original recipe includes extra virgin olive oil but we highly recommend swapping it for our Jalapeno Olive Oil! We also swapped out Tapatio hot sauce in favor of our Formosa, which comes in Jalapeno, Habanero and Chipotle. Get it here. Toss the butternut squash with the paprika, cumin, salt, pepper and Jalapeno Olive Oil. Spread it evenly on the foil-lined baking sheet and bake until well browned, about 45 minutes to an hour. Shake the pan to toss the squash a couple times during the cooking time. Meanwhile, mix the mayonnaise with the Formosa and set aside. When the squash is done, heat a skillet over medium-high heat and quickly heat up the tortillas. To assemble, place two tortillas on each of four plates. Spread a dollop of spicy mayo on each tortilla, topping with a handful of squash, a sprinkle of avocado and onion. Top with some cilantro and feta. Add a sprinkle of freshly ground pepper and a dash of Formosa if you’d like a little more spice.